A movement I would like to start or at least shine a brighter light on is the importance of the skill of communication in our world. I feel communication is completely neglected skill and art that is one of the most important skills to exist with other human beings. In school, children are taught math, reading, writing, history, and other subject to prepare them to eventually go out into the world, get a job, be in a relationship, have a family, contribute to society. One of the most important skills in all facets of life is communication, yet most schools do not have a class where students are taught to responsibly communicate or how to really listen. I believe that if schools would add a few classes teaching some basic communications skills to their curriculum, starting at a young age, this could directly contribute to much positive change in the world. So I’ve often thought of how such a movement could be started or strengthened, so that communication classes could be a part of every child’s curriculum. I had the pleasure to interview Karen Strassman. 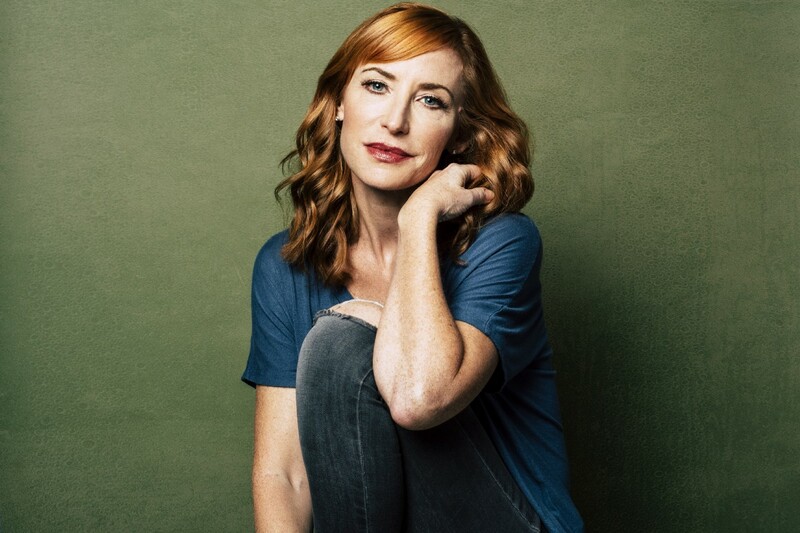 Karen is an accomplished actress with hundreds of film, television, and voiceover credits to her name. 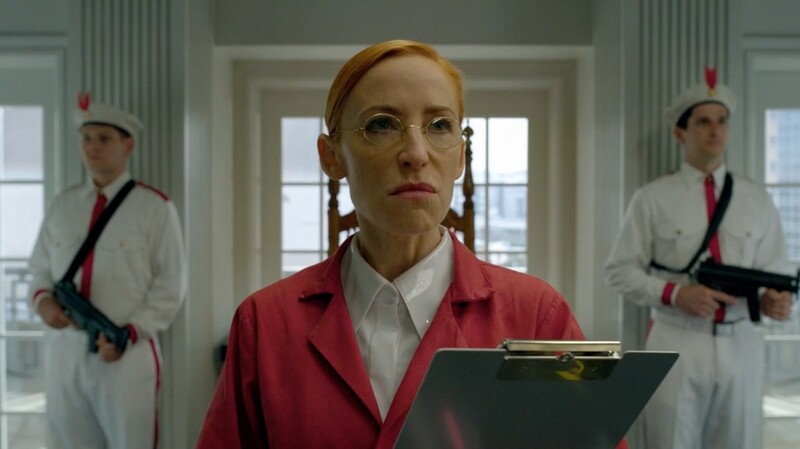 She was most recently seen as Dr. Slotnick on the hit AMC series Preacher. She will next bring her talent to Amazon Prime’s Bosch and the upcoming feature film The Onania Club. Well, curiously, I dreamed of being an actress ever since I was old enough to remember. It was interesting because I had never met anyone who was an actor or even in the business. So it was really a case of “nature” as opposed to “nurture.” Since I had little information about the business, it felt like an inaccessible, intangible fantasy-dream that my parents probably kept hoping I would grow out of, but never did. When I was 13, I was cast in the role of role of Helen Keller in a beautiful production of “The Miracle Worker.” I couldn’t wait to get to the theatre after school for rehearsals, and I never wanted to leave. I blindfolded myself for hours on end, spending any extra time trying to find my way around the theatre or my home without sight, imagining what it was like to be blind and deaf. The whole experience was magical, and when we were on stage it felt like the world opened up in my heart and time stood still. I believe it was then that I fell irreversibly in love with acting, storytelling, and the empathetic nature of this art. However, at that time I didn’t think I was pretty enough or talented enough to pursue acting as a career, so I pursued studies in psychology. It wasn’t until I moved to France at 20 years old that I realized my passion could become a career, and I’ve been making my living doing what I love ever since. I don’t know if this is knee-slapping funny, but I have a lot of affection for this simple and endearing story. When I was a very little girl I was in a “ballet” recital where we were little dancing fairies. At the end of the number, we were supposed to pretend to be sleepy, and then each little fairy was supposed to curl up and go to sleep. I was apparently so committed to my role that when all the little “sleeping” fairies got up and left the stage at the end, I just stayed there in my little world happily curled up all along in the cursor of the stage as a sleeping fairy. In my imagination, I wasn’t on stage anymore, but sleeping on a buttercup in fairyland. I completely forgot that it was a performance, and was in a land of magical make-believe. Apparently the teacher had to come “wake” me up and get me off the stage. I got teased by my family for being the last little cute sleeping fairy, and I remember being very embarrassed and sadly ashamed about it all. For years after I tried so hard to always do things “correctly.” Color inside the lines, so to speak. But now, however many decades later, all I want is to return to this innocence as an artist…to be able lose myself in the experience so completely, just like that little girl who really believed she was that little fairy. That pure state of being, of not even knowing what you will do or say next because you are so lost in the given circumstances of the character’s experience, is now once again my “crack.” Just being in that present moment, in that world of make-believe, allowing myself to experience it as real and be completely absorbed in it. Today, as an artist my goal is to get back to that purity of experience as each unknown moment unfolds. Well, I’ve been blessed to make my living as an actress for almost 30 years now. Doing what I love. How lucky is that? But, kind of riding on the theme from the previous question: I think because I love acting so much, I have always been very focused on succeeding, booking jobs, and generally trying to collect the positive opinions of others. Now for an artist (and I know this is a paradox) the pursuit of these three things can actually be the death or at least the dulling of their richest and free-est inspiration and expression, and thus, their most touching, inspiring, and deeply human work. I’ve been going to auditions for years now, both on-camera, theater, and voiceover, trying to figure out what the producers/writers/directors want and then trying to give that to them. I’ve had a lot of success with all that, obviously. A few years ago, I started studying with Robert Colt (https://www.robertcolt.com) and instead of focusing on ideas about the character, beats, script analysis, and all the traditional acting techniques, Robert started encouraging me to “not know.” To let go of all ideas and preconceptions, just be fully present in each moment, and simply tell the truth in that singular moment in time with whatever words were next in the script. And that is all. I started exploring this way of working with Harold Guskin in New York many years ago, but Robert Colt really helped me to find my way out of all my old techniques and crutches, of not working with a result in mind, but rather, just seeing each new take as a completely new exploration. In the past few years I’ve started to rediscover the pure joy of acting that I had when I was 13 years old, diving into the world of Helen Keller without any notion of what I was doing except for the desire to explore this unique soul’s reality. It’s like free-falling, like skydiving, almost, where you are no longer really in control of what will happen next, but rather as an artist you put yourself in a place where the moment is almost “doing you.” It’s like real life, where life is happening to us, and we are just surfing our way through it. To me this is what makes for really exciting acting, and really exciting art in general.This is what excites me when I watch actors like Matthew McConaughey, Jennifer Lawrence, Annette Bening, Bradley Cooper…you never know what these actors are going to do next, and it make them alive, exciting, and even dangerous in a wonderful way. This is the kind of actor I aspire to be, and it’s a whole new ball game to shed all my trusted techniques and free-fall into the unknown of each present moment and let it play on the strings of my own humanity. I can’t actually talk about a lot of the projects I’m working on now because of NDA’s. But I can share that I am workshopping the character of Blanche Dubois in Tennessee Williams’ “A Streetcar Named Desire”, under the direction of Robert Colt. Williams and Edward Albee are my two all-time favorite playwrights, and diving into the skin of the iconic Blanche is such an endlessly rich exploration. There are so many layers to this complex soul, and to step into the intricately woven tapestry of humanity that Williams has created is such enlivening, heart-wrenching, beautiful human poetry. It’s quite intimidating to allow this character to begin to inhabit me and explore her life, but so rich. I don’t know even know when and where it will be performed but the exploration is so fulfilling, it doesn’t even matter at this point. In our business, we often have to be so focused on the result, that it’s really wonderful when we get a chance to explore as an artist without having to present a tidy finished version. Another project that I am very excited about is Tom Six’s bold feature film, The Onania Club, which will be released sometime in 2019. There is a lot of secrecy around this project, but suffice to say it it’s going to ruffle a lot of feathers. It has amazing cast of female leads. We had such a fantastic time shooting this, collaborating, and pushing the boundaries of what is acceptable and comfortable. Lastly I want to give a shout-out about the Subway Surfers animated series. Based on the online video game, this animated series already has million of views, and is so well done. I play Tricky. Check it out on YouTube. I think what will never cease to move and inspire me is the graciousness of a lot of successful actors/celebrities I’ve had the pleasure of working with. When I worked on Monk many years ago, I had a fun scene and it was one of those long days with a lot of waiting. And Tony Shalhoub walked up to me, introduced himself casually to me as Tony and proceeded to thank me for taking the time out of my life to be on his set, apologized for the long wait and asked me if there was anything I needed. When I first started shooting my storyline in Weeds, and was still very new on that set, Kevin Nealon came into the makeup trailer very early in the morning while I was getting made up, and proceeded to hang out in the chair next to me, chatting with me, getting to know me a bit, and helping me to feel comfortable with him and establish a rapport. I found out later his baby had kept him up all night, and instead of napping in his trailer, he chose to spend the early morning connecting with me so our scenes (which would get amusingly intimate) would have a better chance of going well. I have so many stories of generous and gracious actors like this. I can tell you this…yes, there will always be prima donnas in this business, but most of the successful and talented ones are so humble, human, and gracious. As an actor, the body is our instrument. Actually aside from just the physical body, we each also have an emotional body, a mental body, and a spiritual body. A powerful actor ideally uses all of these bodies in their work. This means one needs to keep each of these bodies in shape, alive, rested, balanced, and nourished to be at the top of your game. My recommendation would be to find ways to take care of all these bodies. So I would recommend that people incorporate into their lives whatever they can to take good care of all these bodies. Each person has to find what works for them. For myself, I swim every morning unless I have a really early call-time. This actually supports all four bodies. I try to eat food that works for my body — for each of us that is different, but too much sugar, for example will make me crash, or eating too much when I’m on set or rehearsing. For me sleep is super important. I don’t need to over do it, but I do have to make sure I get enough. Then there’s taking a good look at the people in your life. Too much negativity or people that drain your energy is going to affect everything in your life, whereas surrounding yourself with supportive, authentic, inspiring people will make more of difference than we realize. Alone time and quiet time are extremely underrated in our culture, and that is so important to connect to our own source and creativity, and of course time in nature helps immeasurably. Each person has different things that work for them, but the main thing is to get to know yourself well enough to know what supports you the best and and also learn what drinks your energy and creativity…what is your personal kryptonite. Also, travel, get out of the small worlds we create for ourselves, and find ways to expand beyond your comfort zone. This is a cliché, but it’s so true. I spent years trying to be something different than who I am, and it’s exhausting. We are each unique. There is no one like each of us anywhere else in the world. The more I accept and embrace who I am, and bring all of me to the show, the more compelling my work is, and the more authentic humanity I actually have to give. 2) It’s not about perfection, it’s about presence. My wonderful career coach Michelle Colt (https://www.michellecolt.com) keeps saying this to me, and I’m finally starting to get it. Ultimately perfection doesn’t even exist, and if it did, it should only be used in math equations and not in art. Perfection in art is boring. What makes any artistic medium so powerful is that you’re not simply just coloring inside the lines. Our imperfections and the authenticity that arises in every moment is what makes any artist way more moving, funny, human, compelling, charismatic, and alive. Real presence is endlessly compelling and so deeply human. 3) Stop trying to please people and speak your own truth. 4) Don’t approach an audition as an audition. Approach each audition as a 2 or 3-minute movie that you get to create. Ed Harris and John Krasinski both talk about this, and approaching auditioning this way has changed everything for me and made the whole thing so much more fun. I have been training with an extraordinary mentor for over 25 years now, and his influence has helped me grow deep roots into what Real Life is and helped me chip away at my social conditioning to something more alive, real, and integrous in my art and my everyday life. He has helped me see that how I choose to live every moment is also an art. And he has given me many techniques to become extremely present and connected in each of my bodies so that I have more access to something a bit more alive and real in my work and my life. I could talk for hours, no days or weeks, about all this man has given me. Check out https://www.cobaltsaffron.com. I would love to site down with a number of actresses who never cease to inspire me with their raw, courageous ability to live in the truth in each moment: Annette Bening, Patricia Clarkson, Helen Mirren, Isabelle Huppert, Robin Wright Penn, Patricia Arquette, Glenn Close, and Laura Linney. These ballsy, raw, real, smart, and enduring talents just humble me with their vulnerability, courage and creative honesty.